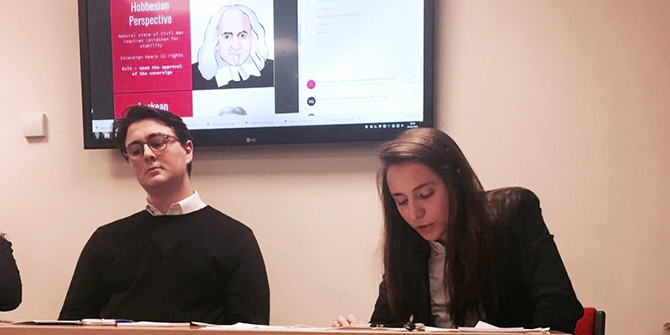 Eponine Howarth reflects on a successful year for the LSE Undergraduate Political Review, which led to them sharing their undergraduate research at the ‘Political Science Association Undergraduate Conference’ and the ‘British Conference for Undergraduate Research’. The Undergraduate Political Review was recently praised in the American Political Science Association’s ‘2018 Undergraduate Research Highlights’, capping an exciting and successful year for the team. This year, the UPR created two research teams to promote qualitative and quantitative research at the undergraduate level. These were independent groups of students under the auspices of the UPR. Each group was composed of five to six team members, including a third year undergraduate ‘team leader’ that would oversee the quality and direction of the research, and divide tasks between individuals. In the Easter break, both teams attended the Political Studies Association Undergraduate Conference in Cardiff and the British Conference for Undergraduate Research in Sheffield, and I was delighted to join the group as a member of the Qualitative Research Team. Undertaking team research has been a wonderful success. It allowed us to discuss our ideas, rely on one another for support, produce a more robust piece, and alleviate the heavy workload of individual research. Our group was composed of five undergraduates: Ludovico Picciotto (1st year Bsc International Relations), Chloe Liu (1st year BSc. Politics and International Relations), Rory Gillis (2nd year BSc. Politics and Philosophy), Facundo Rodriguez (2nd year BSc. Politics and Philosophy), and myself. Despite being at different stages in our respective degree programmes, we were united by our common interest for political theory, which made us strongly suited to conducting research with qualitative methods. We decided to embark on a year-long analysis of the Catalan demand for independence from a social contractarian perspective, assessing the legitimacy of secession from the perspectives of Thomas Hobbes, John Locke and Jean-Jacques Rousseau, which would help understand the transfer of rights from the people to the sovereign which binds humans in the political community, and the legitimacy of the authority of the state over individuals. In March, we travelled to Cardiff to present our paper to fellow politics students at the Political Science Association Undergraduate Conference. As the second presenters of the whole conference, we were unsure of the academic expectations for the presentations and the extent to which we would have to defend our thesis. Nevertheless, as Rory recounts, “our time in Cardiff was a wonderful introduction to the world of academic research. Far from confirming our fears about presenting on and discussing difficult issues, the welcoming and insightful delegates made it a day that will live long in the memory”. Indeed, during the lunch break, where the PSA had kindly provided sandwiches, drinks and desserts, we were even approached by some students who wished to know more about our piece of research and the charges for rebellion and misuse of public funds pressed against the ex-Catalan President, Puigdemont. Our experience in Sheffield a few weeks later was very different to that in Cardiff. 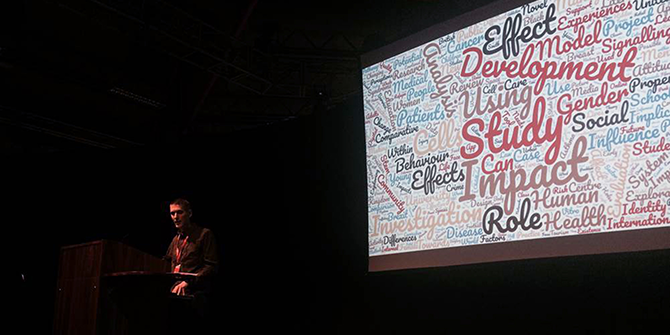 The sessions were mixed, and the audience was therefore specialised in topics outside of the social sciences. In our own group, the delegates’ areas of expertise included geophysics, medicine, and physiotherapy. The challenge was thus to present our research in an accessible way, by providing background information and explaining the basics of social contract theory and the Catalan crisis, without sacrificing its complexity. The result was successful, as questions were able to address some of the complex subject matter discussed, such as the concept of self-annihilation in the Rousseauian perspective. 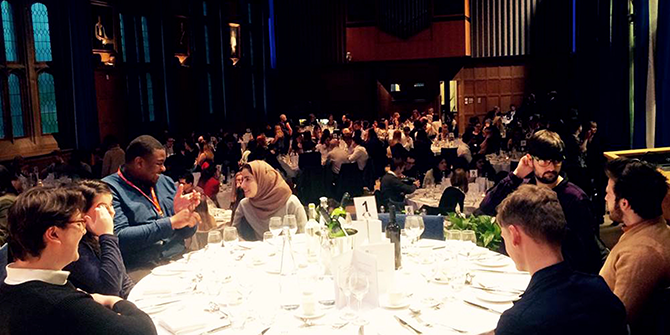 In the evening, the BCUR had organised a formal dinner for all the delegates. As Ludovico noted, this was, “a great opportunity to discuss the research of other delegates in an informal environment”. We were sat at a table of astrophysicists, medical students, philosophers and historians from the University of Sussex. It was an amazing experience befriending so many inspirational students from all disciplines. One of the guest speakers, the Member of Parliament for Sheffield Central, Paul Bloomfield, emphasised the value of education, the importance of research and supporting the initiative of the BCUR. The next day, we were able to sit-back and enjoy the presentations by other delegates on a variety of topics, including on medieval literature, the recovery of shoulder injuries, 3D printing, and the adaptation of maritime animals to climate change. The opportunities for undergraduate research are often scarce. 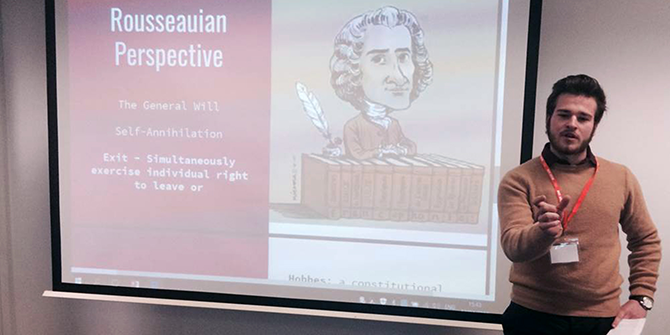 Therefore, the undergraduate research initiative of the Editor in Chief of the Undergraduate Political Review, Hannah Bailey, has been a fantastic way of getting keen students to use their energy, motivation and passion for the benefit of political science research. We would also like to thank the LSE Department of Government, and Professor Cheryl Schonhardt-Bailey in particular, as well as the PSA for their support in making our trips to the BCUR and the PSA possible. 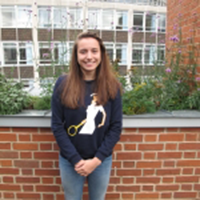 Eponine Howarth is Associate Editor of the LSE Undergraduate Political Review and a 3rd year undergraduate student in BSc Politics and International Relations student in the LSE Department of Government. The LSE Undergraduate Political Review (LSEUPR) is an online platform that aims to encourage and facilitate an engagement in high level political research and the professional presentation of critical arguments by undergraduate students from universities around the world.